When we experience bad things in our lives, our natural instinct seems to be to distance ourselves from them. We do our best not to dwell on them. We move on, hoping that if we just ignore them they will fade away. Often, this works. Maybe we’ll carry the memories with us for the rest of our lives, but as long as the bad things in our past don’t affect our current lives, we’re content. This is what Beyond‘s main character Leena (Noomi Rapace) tries to do. She’s married and has two daughters and seems to lead a happy life. But as it tends to do in films, the past rears its ugly head. A phonecall from a distant hospital informs her that her mother Aili (Outi Mäenpää) is on her deathbed and that she very much wants to see her daughter before her time is up. Leena curiously rejects the idea, but her husband Johan (Ola Rapace, Noomi’s real-life husband at the time) talks her into it. Off goes the entire family on a trip to the farthest reaches of Sweden where Leena’s mother is waiting. That’s one of the two time periods the movie hops back forth between. The other one is back when Leena was a 12-year old girl (played by Tehilla Blad), and we get to follow her life as her family moves into an apartment and tries to settle into the community, having just arrived from Finland. Her mother is constantly suspicious of others. Her father Kimmo (Ville Virtanen) is a recovering alcoholic, but one where a fall off the wagon seems more a matter of “when” than “if”. And her younger brother Sakari (Junior Blad) quietly and curiously observes everything the way some children do. Moving in to the new home is a joyous and hopeful time for the family, but we alreade see the warning signs of what may come. As the film progresses, the tumultous family life becomes more and more evident and we see just why adult Leena is none too keen on getting back in touch with her mother. Beyond (Swedish title Svinalängorna) is the feature directorial debut of veteran actor Pernilla August. Swedes know her from many films, whereas those of you from other parts of the world might be most familiar with her from her role as the nanny Maj in Fanny and Alexander or her part as Anakin’s mother in the Star Wars prequel trilogy. Beyond is an impressive directorial effort, especially in the ways it ties together its two different time periods. We might see something of present Leena that seems odd, only to have its origin explained in a flashback much later on, only for the film to segue back to the present with another cause-effect detail. This might get a bit too explicit at a point or two, but for the most part it’s engagingly orchestrated. I found myself fascinated by the story and structure, which lends the movie a potent mystery feel amidst all the drama. The two time periods are given equal importance, constantly intersecting and showing parallels. The fact that the present parts start out during daytime only to then take place entirely at night is another nice touch, providing a sense of a journey into darkness as Leena reconnects with her childhood. It’s the actors who stand out in this film, however. Noomi Rapace garnered plenty of well-earned praise when she portrayed hard-as-nails Lisbeth Salander in the Millenium trilogy a few years ago. She’s even more impressive here, almost toying with the lingering memory of the Lisbeth role as Leena first starts out seeming stoic and indifferent only to gradually crack. Perhaps even better is her younger counterpart Tehilla Blad (who also played Lisbeth as a child in those three movies). There’s so much to recognize in the ways she copes with the mounting distress in her life, the way she hurries off to occupy herself with some mundane task when her parents fight or how she looks after her brother just as much for her own sake as for his. And yet happiness shines through in the rare times when she’s met with her parents’ approval. This is a tough task for someone so young, but Blad nails the performance. The supporting parts are equally good, with Mäenpää and Virtanen in particular providing brutal emotional energy to their parts. And in a less flashy role we find Ola Rapace, playing husband Johan as a calm and collected supporter, rolling with the punches to the best of his abilities. I’m somewhat reminded of Stanley Tucci‘s fine turn as Meryl Streep‘s husband in Julie & Julia, even if that film was decidedly more light-hearted than this one. It took a little time to win me over, but I ended up really liking Beyond in the end. It’s a potent tale of domestic hardships, showing that the past can be hurtful no matter how much distance we put to it. There are scenes here of great discomfort, such as the icy indifferent stare of Leena as she watches her mother in the hospital bed, the painful arguing going on in her youth and how this manifests itself in the present with her and her own family. It’s a heavy film, not so much in content as in emotional toll. The story doesn’t break any new ground perhaps, but it’s fascinating and gripping nonetheless. Pernilla August has put together an impressive movie, and I’m eager to see what she’ll come out with next. Beyond is Sweden’s submission to the Academy’s Foreign Language Film Oscar this year. I’m guessing the Academy will like it, but whether that’s enough or not to win the award is anyone’s guess. I do hope it makes it past the first round or two of the nomination process, if only so that more people will become aware of it and check it out. It’s a film well worth seeing. I’m afraid this one didn’t win me over. I found the storytelling a bit lacking. It was as if they had just put together a bunch of tableaus. For all the misery I didn’t get invested in the characters. I just thought to myself: “yeah, Noomi is sulking once again. Can’t they ever let her play anything but an angry woman staring emptily?” I guess it was a 3/5 in my book. Definitely not more. To each their own, I suppose. I thought Noomi showed a lot more range here than in the Millenium films. Maj made a movie? Oh, I am definitely gonna look for this one. 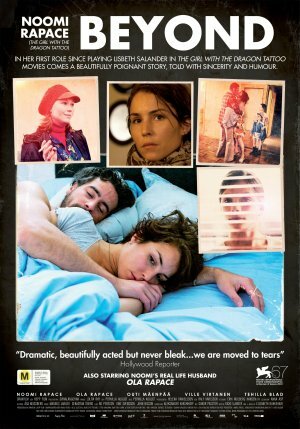 I do like Pernilla August and Noomi Rapace is a fantastic actress. Hopefully I won’t have to wait too long for the DVD. Yeah, definitely check it out when you get the chance. How long do you typically have to wait in America for foreign films to arrive? I assume it differs wildly, but if it does well with the Academy it might speed things up. It opened in Swedish theaters back in December last year. Hahaha I don’t live in America. Worse. I live in New Zealand, though I have both American and Swedish heritage. Here in NZ we have to wait ages for most films. Sometimes with the big box office movies we get them fairly promptly, but with foreign films like this or, say, CERTIFIED COPY, you have to wait a fair bit longer. Oh right! I forgot you were from NZ. Now that you mentioned it, I remember talking about Eagle vs Shark with you a while ago. My bad. Sounds like you’re in a similar boat to me, then. A Pirate of the Caribbean or Transformers flick will arrive early, but then we get to wait half a year or so for the Blue Valentines and the like. And I am happy that Tehilla, who happens to be my daughter, even impress people on the other side of the earth, with her acting in this film. A kind of surrealistic feeling. The praise is well-earned. She was teriffic. You have every reason to be proud of her. I really am intrigued now and this looks like a great film!! Thank you for the kind words, Scott. Felt like I had to write something about this film so that word woudl get around a tiny bit on it. It’s well worth seeing, and I hope you enjoy it if you get around to seeing it at some point. I’m doing fine. Had a great weekend. Hope you’re doing well too.